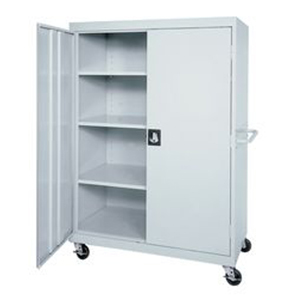 Perfect for storing office supplies and other medium heavy products that need to be kept unseen and/or locked up. 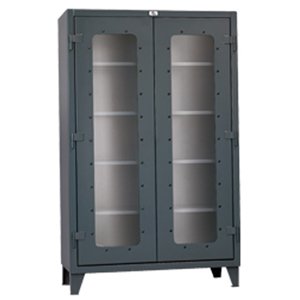 These cabinets are typically constructed of 16-22 gauge steel and have a capacity of 200-400 lb.s per shelf evenly distributed. Learn More. All welded cabinets are made for the harshest of environments. 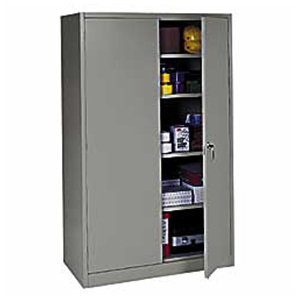 Since welded cabinets are made from steel as thick as 12 gauge, their capacities far exceed their bolt together counterparts reaching up to and beyond the 1,000 lb per shelf range. Learn More. With an all welded cabinet housing and drawer glides that can handle 400 lbs per shelf these cabinets are perfect in harsh environments. Cabinets can be filled with any 3″-12″ high and can be further broken down to smaller compartments. Learn More. 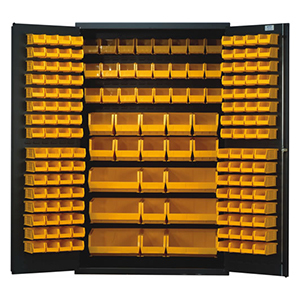 Heavy-duty all welded cabinet with a louvers to hang any combination of bins. Cabinets can also accommodate extra shelves, modular drawers, and perforated panels. Perfect for small valuable parts that need to be locked up. Learn More. 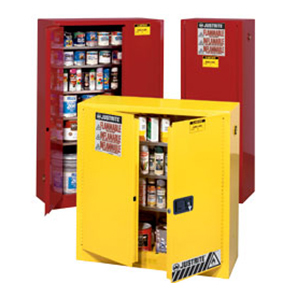 Whether you have flammables, combustibles, pesticides, or corrosives and are keeping them in cans, drums or cylinders we have the right cabinet to keep you OSHA compliant. Learn More. 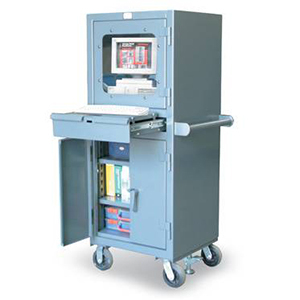 Mobile or stationary these cabinets are designed to hold a computer monitor, tower, and all the accessories keeping it safe from dirt and theft. These cabinets come fully equipped with a power outlet and fan for circulation. Learn More. Mobile can be used to describe any cabinet on wheels. 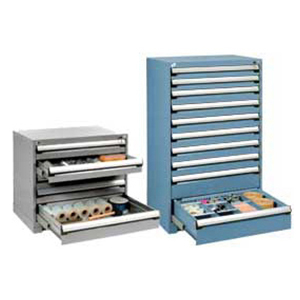 Typically you will find modular drawer cabinets mobile as they are perfect for tool storage, but any welded cabinet even bin cabinets can be designed to be mobile. Learn More.